Akva Geo accumulator is particularly suitable and designed for systems with a heat pump. This is often an Air-to-Water pump like a Jaspi Comfort Mono / Split or Nordic. These accumulators are fitted with two indirect coils; They are both used for the domestic hot water, one at the lower part of the tank is for pre-heating and the second coil located above the internal baffle plate is for superheating the water before it leaves to your taps and showers. Both coils can work at the mains water pressure up to 10 bar. Twin domestic hot water coil configuration captures all the available heat and allows the system to work on lower temperatures whilst still supplying ample amount of domestic hot water. This again is an advantage when the system runs with a heat pump. 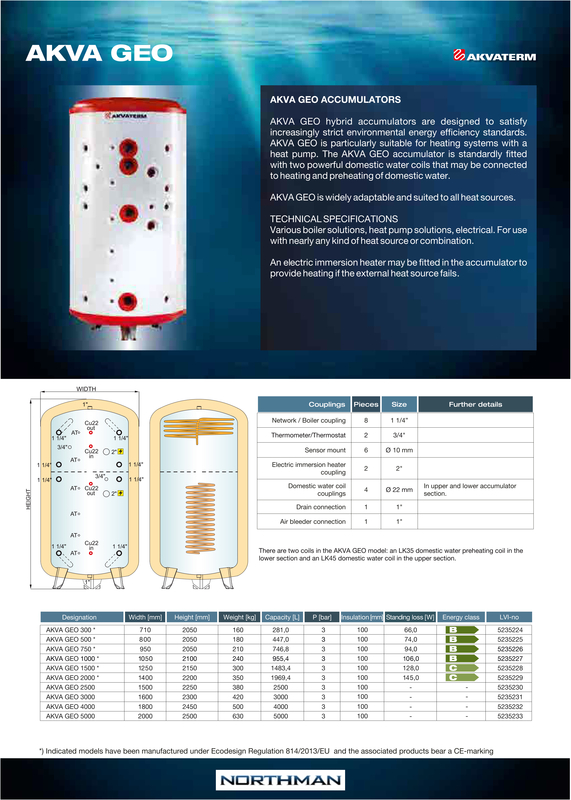 As well as connecting to heat pumps, Akva Geo accumulators can be connected to several other heat sources through multiple couplings across the tank. Akva Geo is an ideal accumulator for the properties where a fully automated and reliable heating system is required. A heat pump will work independently as a main heat source and as the accumulator can be fitted with two immersion heaters, they will provide back-up and boost when needed. Simple, reliable and service free. As all the Akvaterm accumulators, Akva Geo is fitted with new seamless high quality closed cell polyurethane insulation which offers ultra low heat heat loss and reduced overall diameter. Models up to 2000L are manufactured under Ecodesign regulation 814/2013/EU and they bear a CE-marking. Akva Geo has multiple connection points; 8 couplings for the heating flow/return, 6 thermometer/sensor couplings, 2 for thermostats and also 1" airing + drain points. Furthermore, there are 2 immersion heater connections which can also be used for heating flow / return if required.